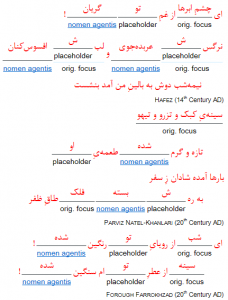 In addition, there are some patterns that are only used for the attribution of nomina patientis and nomina agentis. In present chapter, general and common fetures of adjectival phrases are discussed. The grammatical category degree of an adjectival phrase indicates the relative size of the feature expressed with the adjectival phrase. 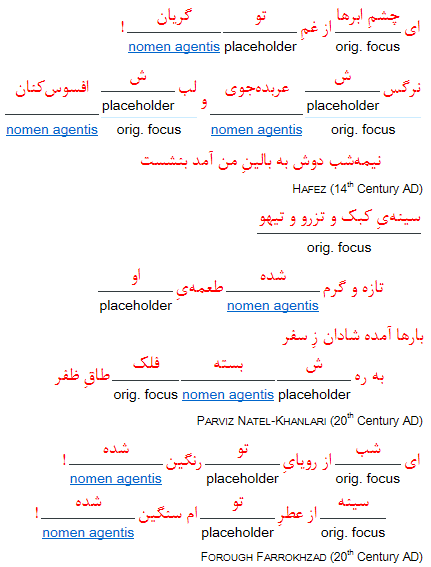 The comparative (primarily in archaic idioms of Persian) indicates an adjectival phrase that (compared with a reference value) have a higher degree of a feature. However, there are adjectival phrases in the comparative without the inflectional suffix /-tær/. These are /æfzun/ افزون, /fozun/ فزون, /beh/ به, /biʃ/ بیش, /ziɒdæ/ زیاده, /kæm/ کم, /keh/ که and /meh/ مه. The superlative refers to the supreme extent of the feature that is expressed by the adjectival phrase compared with all elements in the superset. The elative refers to the greatest possible size of a feature, without comparing it with other instances. آرزو می‌کنم هر چه بیشتر /hær ʧe biʃtær/ (= as much as possible) با من باشند. به حرمتی هر چه تمام‌تر /hær ʧe tæmɒmtær/ (= as complete as possible) و به عزمی هر چه صادق‌تر /hær ʧe sɒdeɣtær/ (= as truthful as possible) کشتی‌ها را به طرفِ حصار راندند. کار نیشاپور در عهدِ ریاستِ او نظامی هر چه تمام‌تر /hær ʧe tæmɒmtær/ (= as complete as possible) گرفت. مردم به سخنِ او باور نمی‌کردگی /næmeː-kærdægi/ شدند. Gradation is the assigning of a feature to an adjectival phrase in gradual steps.